As a big fan of the first 3 Jurassic Park movies, you can imagine my joy when Jurassic World was announced. Sure it had its issues of logic where high heels are durable enough to run through mud, swamp and away from chasing dinosaurs that want to snack on you but overall it was still an enjoyable ride. 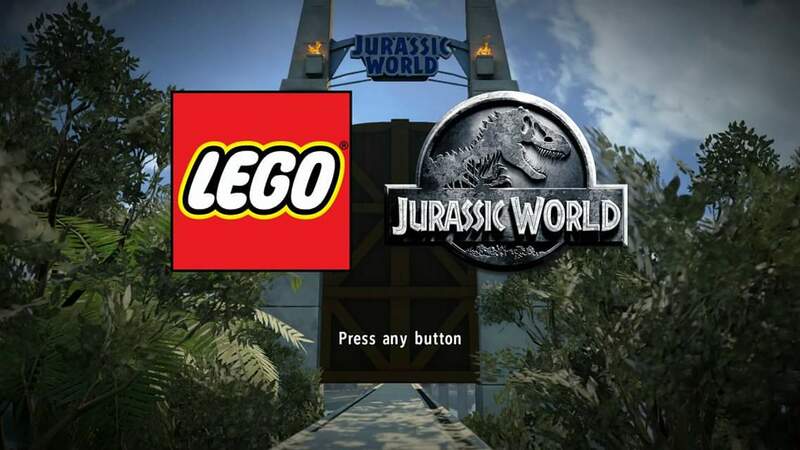 When I got my copy of Lego Jurassic World, you can imagine the joy when I popped it into my Playstation 4 and saw the welcome screen. Yes that familiar scene of the big huge iconic gates. It felt like home away from home again. Like every other Lego game, everything and anything that is not a character can be broken down into the signature Lego bits and reused, reformed and rebuilt. The characters from all 4 movies (yes including bike riding star lord who now commands raptors) is available for you to unlock and play including that irritating husband and wife from Jurassic Park 3. Do not expect fancy super powers here though as these characters are all normal humans in the movies so their skills are more down to earth. Palaeontologists will be the diggers, Zoologists go exploring dinosaur poo, and hunters will have the ability to set off targets from afar. One thing that puzzles me is screaming based skills that only women have. Come on, there were many (many) men who screamed their lungs out in the movies too. Combat is what you will expect from the previous Lego adventures, just that now you are a small little Lego sized character trying to run from big huge Lego dinosaurs that hurt a lot even with one bite or swipe of their claws. Only thing is that it can be rather irritating when these packs of dinosaurs seems to keep on appearing like the DNA machine is on overdrive mode. I know they made lots of dinosaurs but it gets really ridiculous sometimes till you solve the puzzle or game goal. Well at least the scenarios from the movies are a tad more enjoyable like saving Lex and Tim, moving about that huge tree to reach the crashed jeep and memorable T-Rex car chase while throwing flares into the T-Rex’s mouth. Brings back memories of little me asking my dad in the cinema why flares can actually help against a giant sized dinosaur. Sadly the one thing that made the Jurassic Park series what it is, the size of and nature of the giant theme park, is the most disappointing part of the game. While most levels are fun to play through, the over world is really messy. Quick travel can be quite a time consuming experience especially when you have to scan through the icons which automatically load map objectives to find that area to explore for the entry to the next. Feel likes a real life theme park where each ride is fun but walking to the next one is a bore. Overall Lego Jurassic World is still a positive experience once you get used to the boring move about the over world bit. 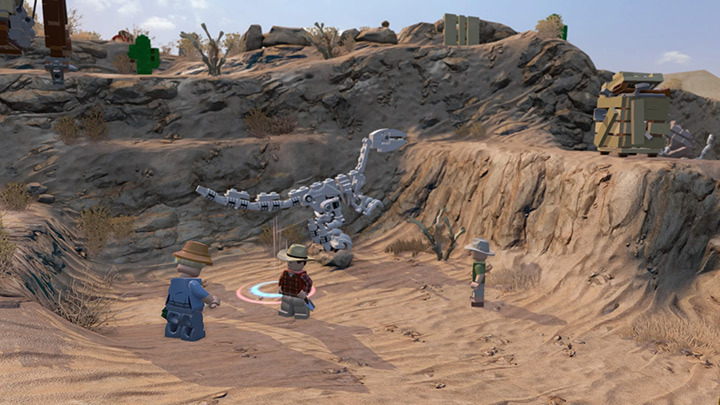 While the game engine is nothing new, that same tried and tested formula still works here and somehow all these characters and dinosaurs are faithfully recreated into Lego form which will make fans of the movie series very happy. 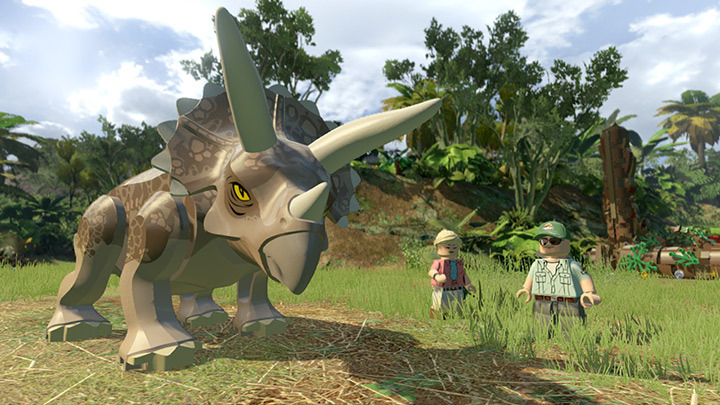 Jurassic Park movie fans and Lego games fans will definitely want to check this game out.